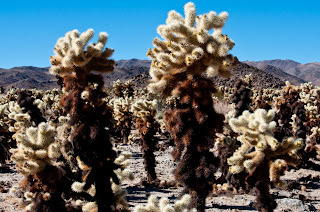 The cholla cactus garden at Joshua Tree National Park is located right next to the Octotillo Flats area, in the low desert portion of the park. For those unfamiliar with JTNP, the park basically has two very different ecosystems; namely, the low Colorado Desert portion (below 3000 ft) and the high Mojave Desert portion (above 3000 ft). The low Colorado desert portion is warmer than the high desert portion, more barren, and populated by cholla cactus and ocotillo. The cholla cactus and the ocotillo are two of the four characteristic desert plants of the the Southwest USA and northern Mexico. The other two characteristic plants are both in the yucca family and more widely found in the high Mojave Desert portion. In particular, they are the Joshua Tree (Yucca brevifolia) and the Banana Yucca (Yucca Baccata). JTNP's cholla cactus garden is a dense, localized (just a few square miles), forest of teddy-bear (Cylindropuntia bigelovii) cholla cactus. Only a small portion of the small forest is open to visiting. The hiking trail is a short and flat 1/4 mile. The teddy-bear moniker is based on the fact that from a distance, and especially when back-lit (see this discription describing best times of day for picture taking), the plants appear soft and fuzzy, giving it the name "teddy bear". Cholla cacti produce few seeds. The plant usually reproduces from dropped stems. These stems are often carried for some distance by sticking to the hair of animals. Often small "forests" of these chollas form that are largely clones of one individual/original cholla plant. This "cloning" of a single plant in a narrow area is why cholla forests are often densely packed. 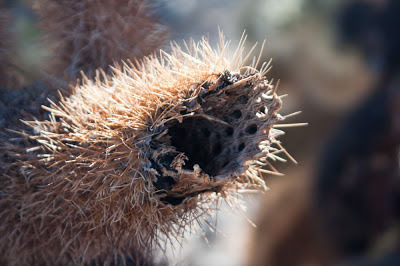 When a piece of cholla sticks to an unsuspecting person, a good method to remove the cactus is with a hair comb (video on how to remove teddy bear cholla spines). The spines are barbed, and hold on tightly. Some people seem to find it amusing to post videos of themselves being barbed by the chollas: (ouch #1), (ouch #2). After one of my earliest visits to a cholla forest in the Mojave National Preserve/Cima Dome area, I had got a bunch of cholla barbs in my calfs. I had some kind of allergic reaction to the cholla and had to go on some steriods; the itching drive me nuts. 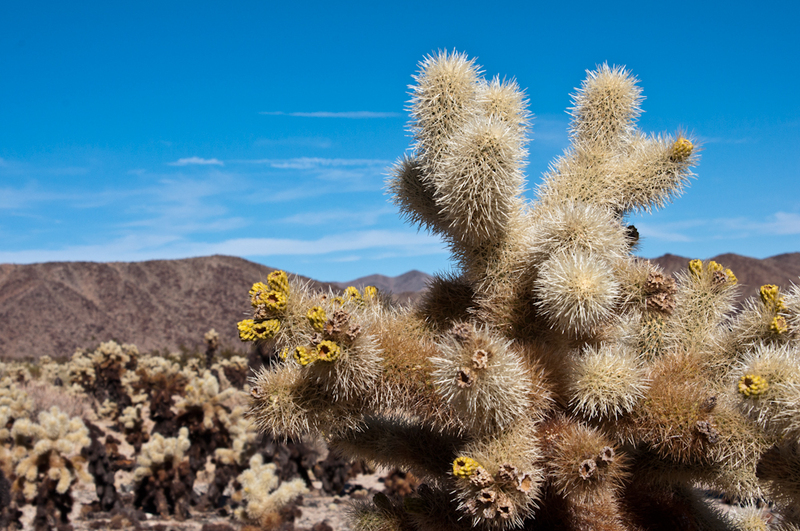 The teddy-bear cholla is extremely combustible. This is shown in the following series of pictures. 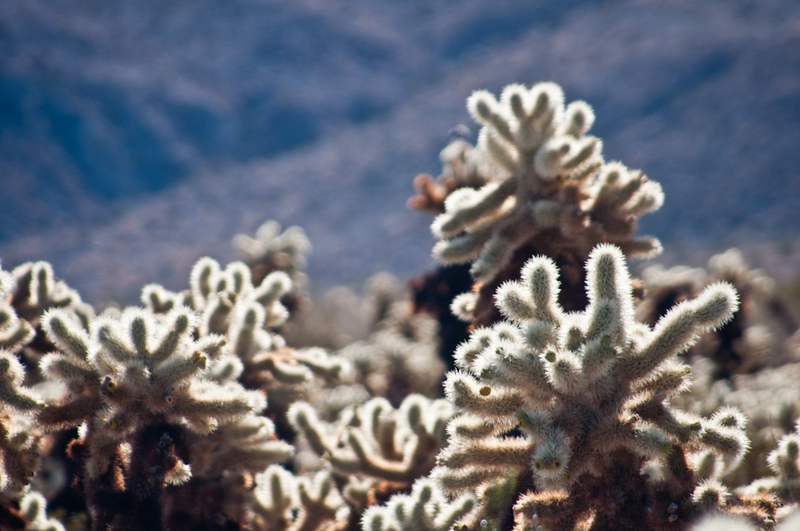 The nickname "The Jumping Cactus" was given to the Teddy Bear Cholla as people swore as they passed by one, the plant jumped out at them, leaving several painful spines stuck in their knee or other body part. 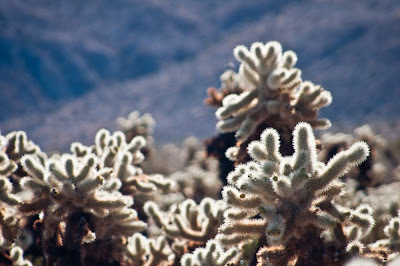 In fact, the Teddy Bear Cholla does not move on its own. 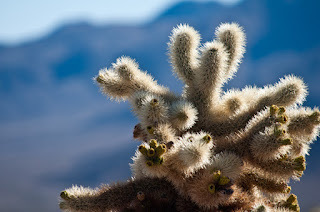 The tiny spines on the Teddy Bear Cholla are very easily removed from the plant, so if you even lightly brush up against it, you will have many tiny spines stuck in your knee or what ever body part touched the plant. In fact, horse-riding cowboys began wearing thick leather chaps to protect their legs primarily from the Teddy Bear Cholla. So, don't let anyone scare you into thinking there are plants in the Sonoran Desert that will "attack" you. 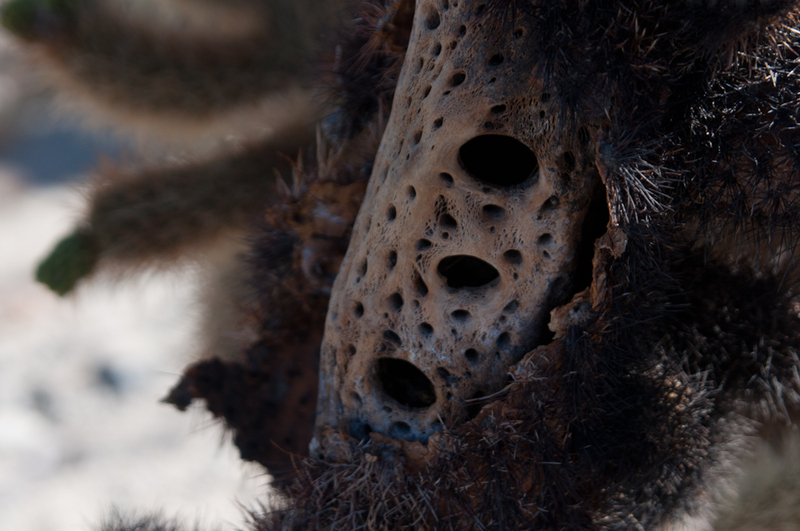 The only way you can be injured by the Teddy Bear Cholla is to touch it.